We would like to thank Dr Geraldine Finlayson and Sue Davies for the photograhps © Gibraltar Museum: Caves from the sea (© J.C. Finlayson), Neanderthal rock engraving (© S.Finlayson), Gorham's Cave reconstruction (© S.Finlayson). An interview with Dr Geraldine Finlayson on the eve of the decision to designate Gorham's Cave Complex a World Heritage site. On 15 July 2016 Gorham’s Cave Complex, in the UK's Overseas Territory of Gibraltar, became the UK's thirtieth World Heritage site. Gorham’s Cave is 137 metres deep (into the limestone), 40 metres high and 70 metres wide at its entrance. 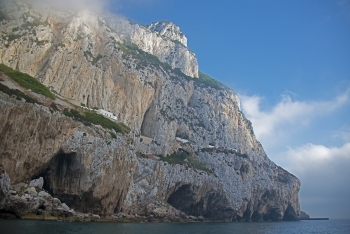 It is the last known site of Neanderthal occupation in the world; other caves in the complex at the base of the eastern face of Gibraltar are Vanguard, Bennett's and Hyena. Dr Geraldine Finlayson, Deputy Director of the Gibraltar Museum, first visited the caves in the 1970s but did not look at the caves from an archaeological point of view until 1991. Geraldine and Sue Davies, Head of Cultural Heritage at the museum, say that the caves were inhabited from 127,000BC and the latest date for habitation by Neanderthals is estimated at around 32,000 years ago. Excavations have shown that the Neanderthals were very different than traditionally perceived. The discovery which immediately captures the imagination is an engraving, uncovered in 2012, which is evidence of symbolic thought. The engraving, the first known example of Neanderthal art, is made up of vertical and horizontal lines and rigorous tests have shown that these marks were deliberately made, stone on stone, taking at least an hour of concentrated effort and a lot of strength. It has been estimated that marks would have been made around sixty times, repeatedly going over the same lines with painstaking precision. Technical knowledge is also shown as the stone implement marking the rock would have been a much harder rock in order to make the engraving. 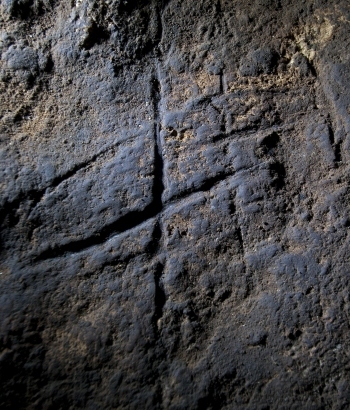 There is no direct date for the age of the Neanderthal engraving but it is in the bedrock, low down at the back of the cave and could have been made standing or kneeling. Over the years it had become covered with sediment and was close to where there had been a hearth, a secure area behind a fire. The cave, which is shaped like a wigwam, has a natural chimney. Theories as to the purpose of the engraving are many but Dr Finlayson mentioned the possibility of the pattern of lines on the hand of a Neanderthal signifying “I am here, this is my territory”. Sue Davies mentioned the similarity to a stylised hoopoe bird. Vanguard cave is slightly older and was sealed by sand during Neolithic times. Evidence of the exploitation of marine resources has been found, something not previously attributed to Neanderthals. Dolphins had been de-fleshed and seals were caught. Mussels and limpets were collected; shells were found at the back of caves along with implements used. Birds were also a source of food and feathers, particularly black feathers were used as adornment. 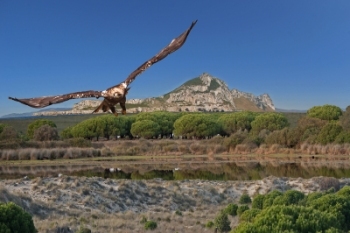 One fact which perhaps many of us do not realize, and which has been said by Professor Clive Finlayson, the Director of the Gibraltar Museum, is that Neanderthals were on the planet for much longer than we have been. So what is our connection with Neanderthals? The use of DNA investigations has shown that everyone has some Neanderthal genes, 2% per individual although not necessarily the same 2%. These discoveries in the Gorham’s Cave Complex will be a great boost to the community; acting as a catalyst to look after other areas of Gibraltar's heritage. There is the potential for some economic growth and the creation of jobs in the heritage sector - all this ties in with the Gibraltar’s new university and studies in subjects such as tourism and palaeontology. At the moment (June 2016) the Gorham’s Cave project involves around forty-four institutions and around twenty countries, a truly international venture.